Juno, one leg of the Yod, is about trust and loyalty (AND betrayal). 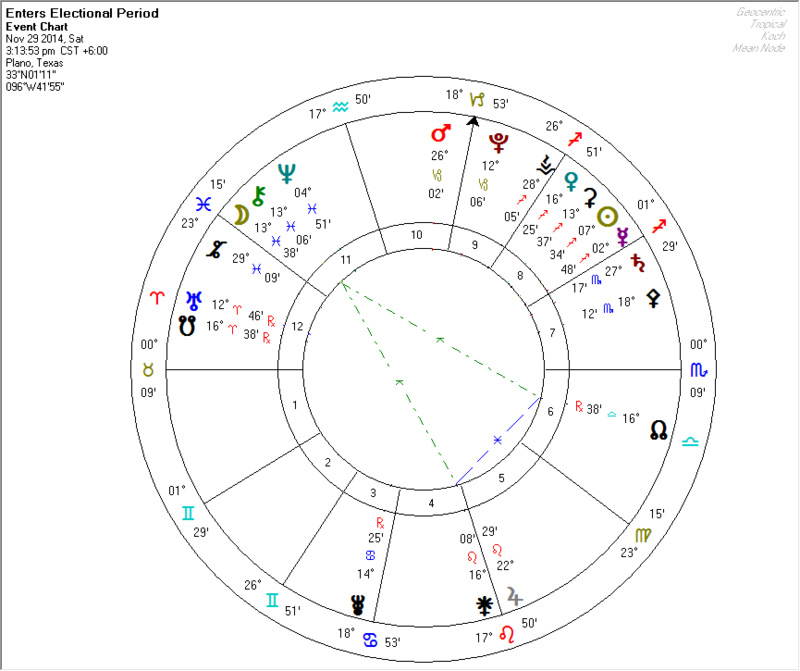 The Node, the other leg of the Yod, is about doing the tough and difficulty thing that is “the right thing.” Moon (both our inner state and the current state of affairs) joins Chiron (the wounded healer) to activate this relationship fully. If you are in a bad relationship, this is a good time to leave without any intent to return. Polarizing influences exist in the sky in the form of both a Rosetta and a Hele. This means that people (possibly family members) will “take sides” (or polarize) in this dispute. Note that Moon/Chiron is allied with Hygeia (health and healthcare issues). In the Hele, Uranus and Pallas are involved along with Moon/Chiron and Juno. Thus the Hele is interconnected with, and overlaps with, the Yod. Uranus brings in both unpredictability and insights; Pallas emphasizes insights, awareness, and the need to take action. This set of issues must be resolved. We think this is a mostly benevolent pattern. With Hygeia prominent and retrograde, health and healthcare issues will be at center stage. This Thanksgiving many will be thinking about avoiding overeating and the perils to health that can bring. Ceres and Venus (12 and 13 Sagittarius, respectively) will also emphasize this same theme. 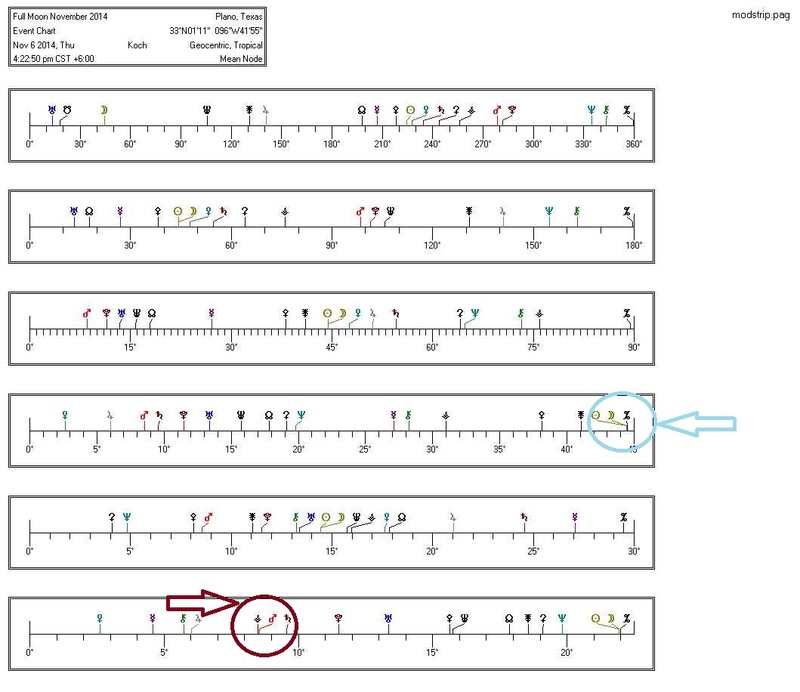 The involvement of the nodes here tell us that some people will overdo it, and this may prompt a “wakeup call” for some. A number of other interesting aspects are in play. 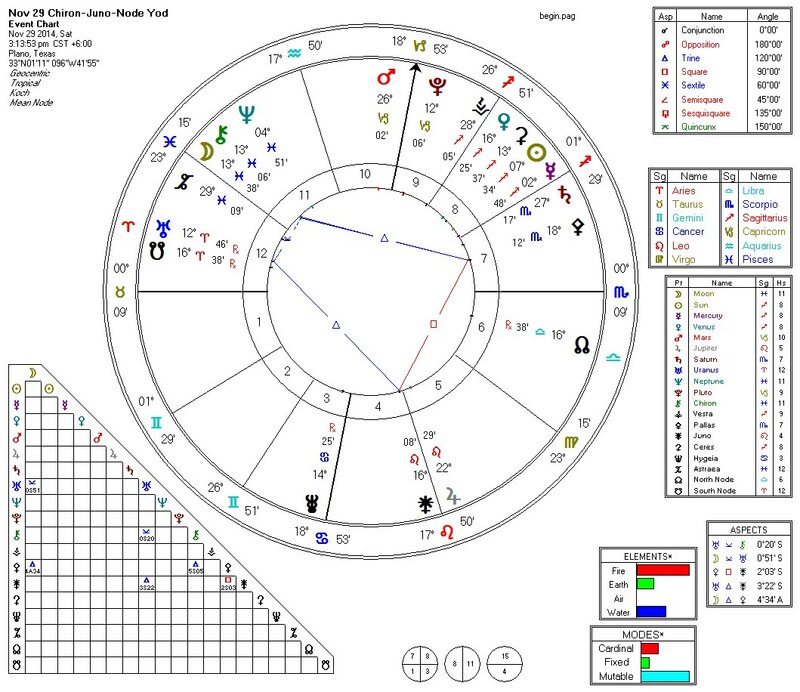 Venus (Sadge) is still square Chiron (Pisces) emphasizing healing issues further. These may be emotional and familial rather than physical. Sun has recently (the day before) completed a square to Neptune, which also emphasizes healing and mercy in the high form but can involve deception or drugs / alcohol in the low form. Astraea is near a sign change (moving from Pisces to Aries) suggesting that some overdue justice may emerge in the days following Thanksgiving. 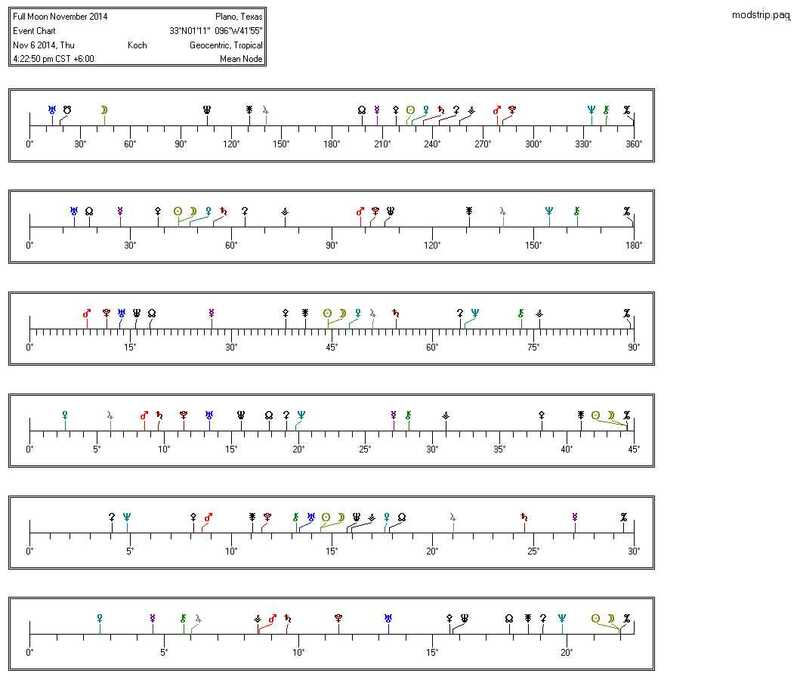 We will leave the discussion of the significance of the NM at 0 degrees Sadge to others and focus on the patterns of aspects instead. 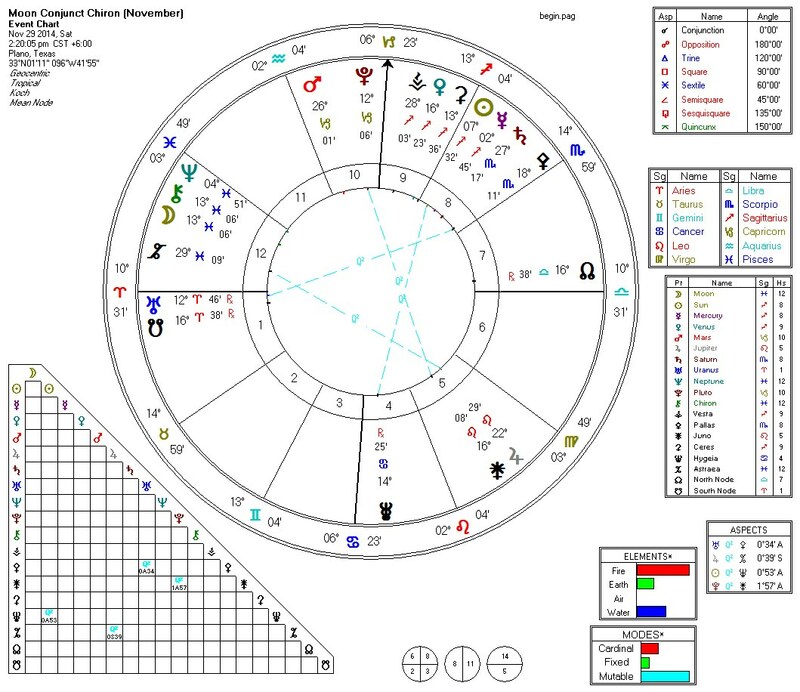 Also mentioned previously are the grand trines in play (again, using asteroids), though now they are greatly reduced from when the Moon was in Cancer. Opportunities are still available, but the window is not as strong as earlier. For someone “willing to do the work,” the payoff can be significant! Once you have watched that video, re-read our analysis and see if it makes more sense! If nothing else makes sense, then try this: TEST the “News Year’s Resolutions” you have planned for 2015 to see WHAT WORKS starting with this New Moon. Avoid that same old cycle of unrealistic high hopes on January 1st followed by quitting on the third Monday in January (aka “Blue Monday”). This is your chance to do something different this year! 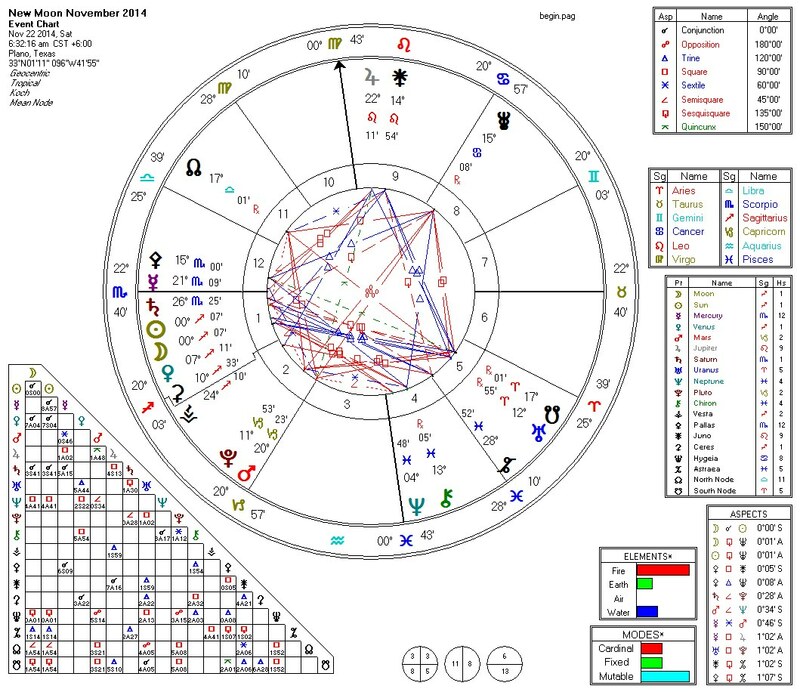 The Moon in Cancer in November of 2014 creates a series of interesting (and contradictory!) patterns. 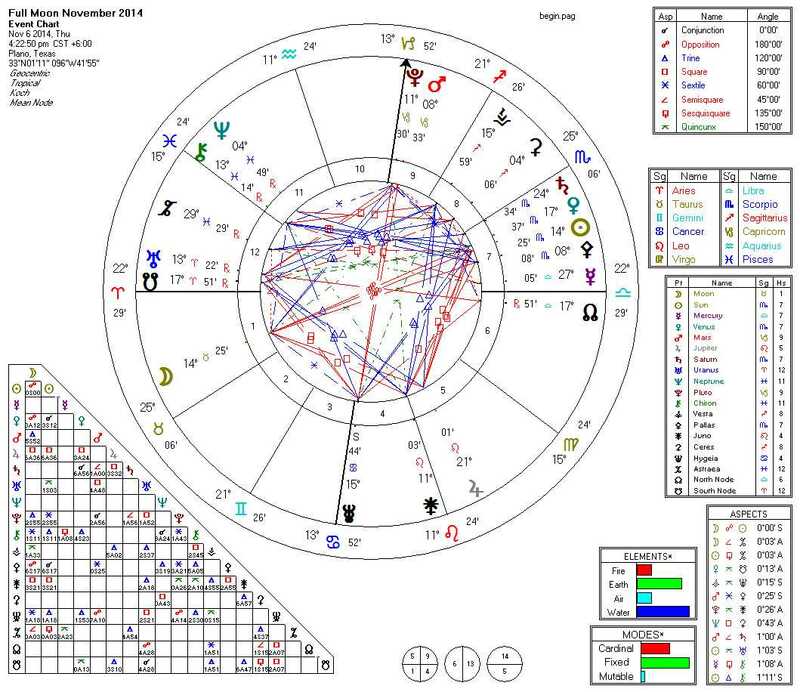 On one hand, Moon will join with Uranus and Pluto (in the well known and often discussed Uranus/Pluto square pattern) to form a T-Square. 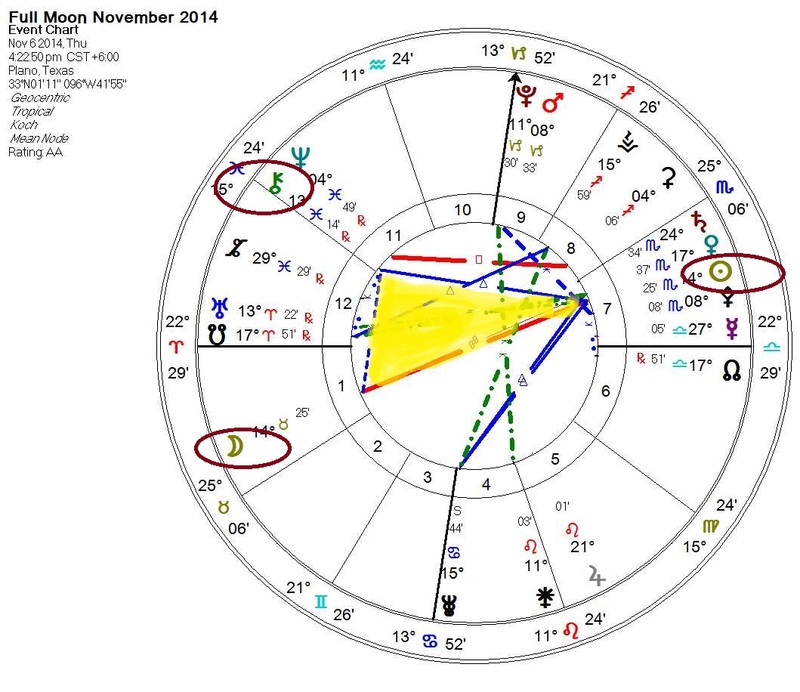 On the other hand, the Moon will join with Mars and Neptune to form a Grand Trine (Grand Water Trine). The first causes conflict and energizes people to “take action” while the second tends to be gentler and more relaxed (and sometimes an opportunity to make a quite a bit of money). 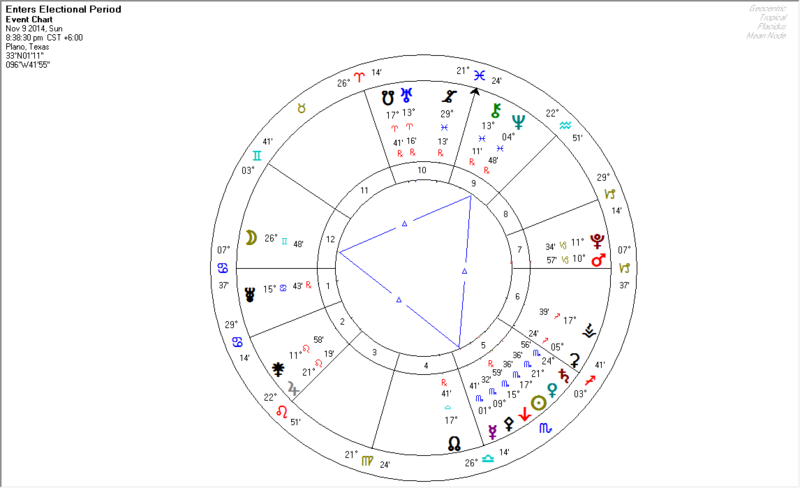 Moments of greatest tension occur when (1) Moon opposes Pluto, (2) Moon squares Uranus, and (3) Moon conjoins Hygeia (an asteroid governing health and health issues). 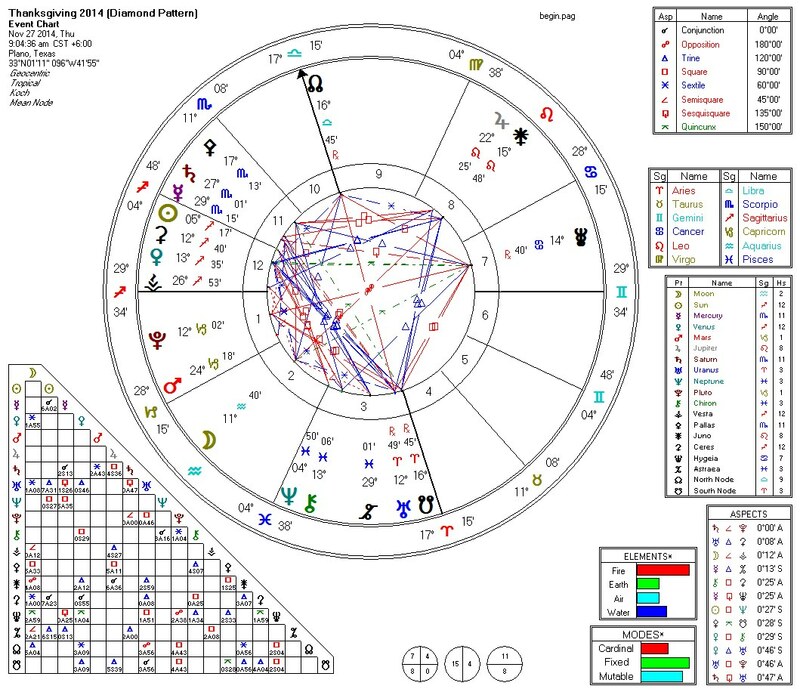 If one counts the node (a point and not an actual body), then one might argue this is an (ongoing) grand cross. Ordinarily, we would describe this period as being either “energetic” or “challenging” depending on how you use (or flow through) the energy. 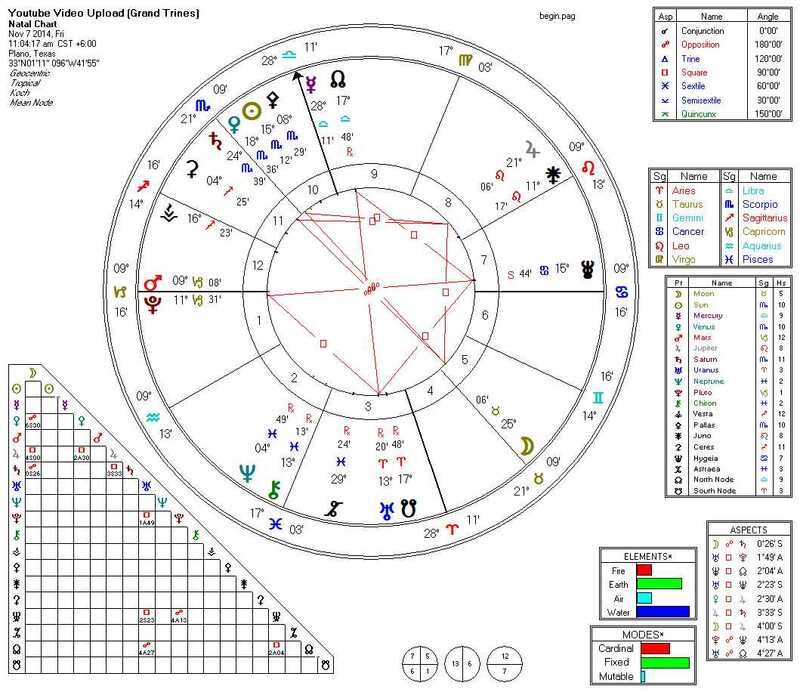 But a grand trine (a grand water trine) is in play as well! This pattern actually begins on November 9th (as we are writing the second part of this entry) and concludes later on the 10th. If you have been looking for a window to “get things done,” then this window of time is it! While most signs benefit during this period, Scorpios benefit most. We see some indication that we may be entering a period of austerity (or a cold winter?) as Venus is between the Sun and Saturn (all in Scorpio) with Mars applying to conjoin Saturn (both in Capricorn). 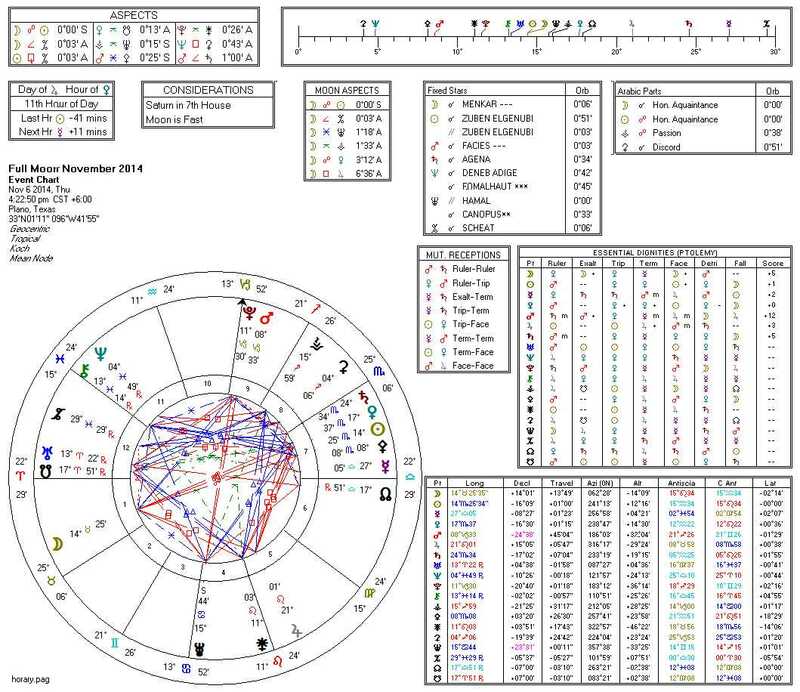 Saturn and Pluto continue in mutual reception, as has been true since 2012. Will be interesting to see what the financial markets do. 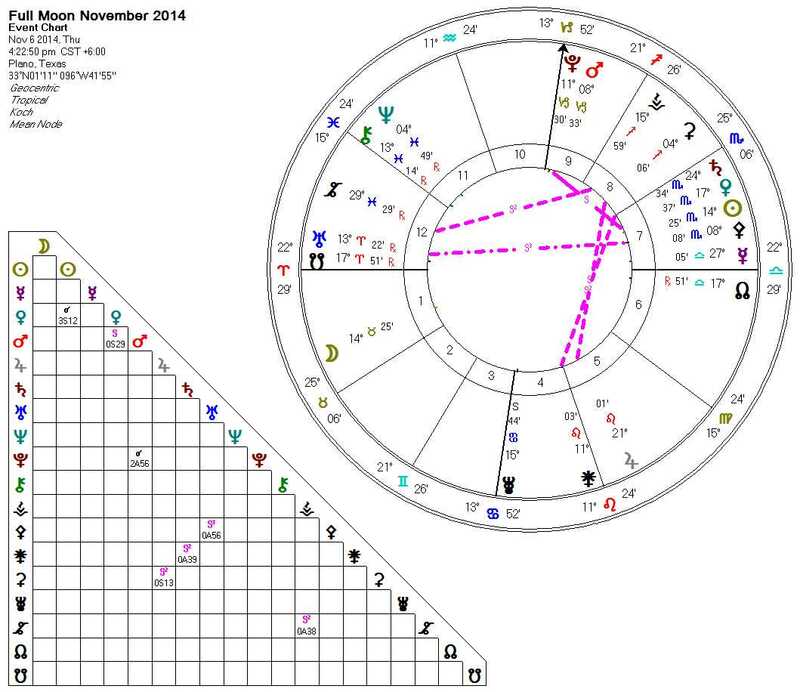 We note that Mars and Vesta are semi-octile, and that might be the most important aspect during this full moon. (More discussion on this below after the Modulus Sort Strips.) We also note a Huber triangle involving Sun / Moon / Chiron (as shown in the next version of the chart). One thing that benefits this full moon is that none of the planets are peregrine. The arabic parts generally look favorable as well. Here is last year’s November Scorpio / Taurus full moon. 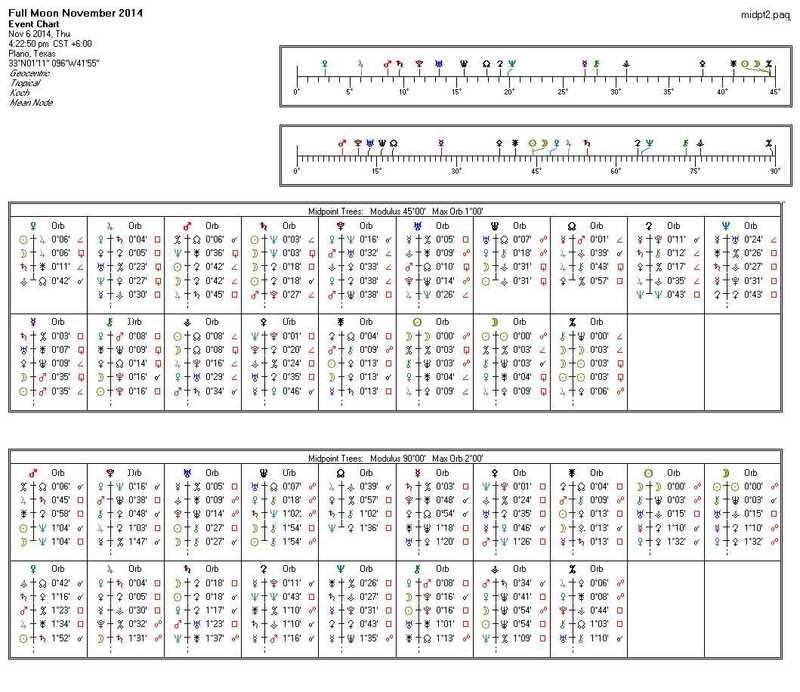 Notice that the last strip, the 22.5 strip, shows Vesta/Mars next to each other. This means that they are “semi-octile” with is a 16th Harmonic aspect. But, what does that mean? Discussions abound, and opinions vary. My interpretation is that the semi-octile is a kind of “irritation,” a bit like the persistent annoyance of a pebble in the shoe that ultimately must be addressed. With Vesta/Mars the two bodies joined by semi-octile, we suspect some people may be either quite irritable or outright enraged (possibly by some event near the FM). We will see some of this after the elections in the U.S., but they not a cause of the problem (the elections reflect other underlying problems). Any polarization that occurred with the Rosettas of October will more clearly emerge at this time. Remember, also, that on a much large scale we are choosing (collectively and individually) one of two major forks in the road (i.e. The Grand Yod). We have indicated Mars/ Vesta in the 22.5 strip in this last graphic using deep red. (The 22.5 strip is the last in the series.) Two strips above it, the fourth in the series, is the 45 degree strip. 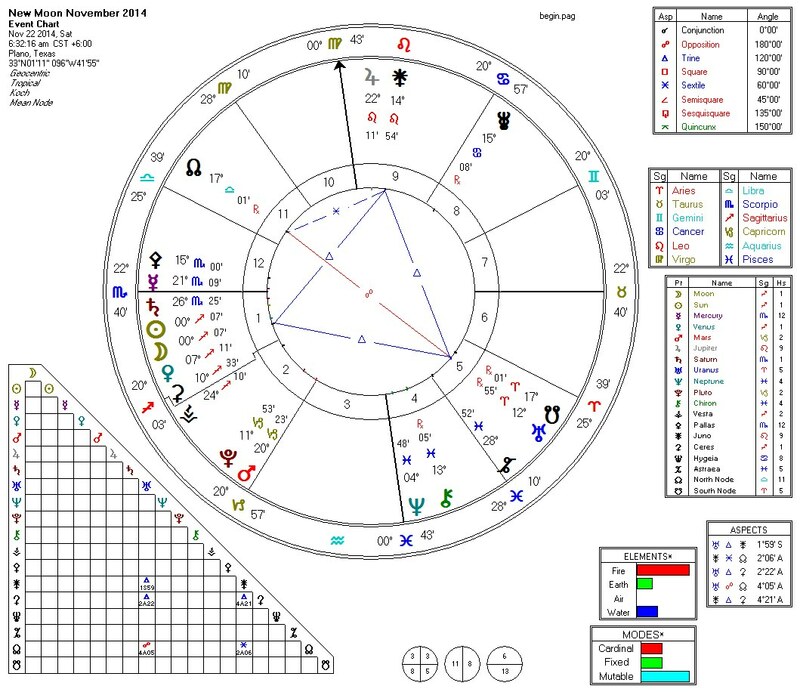 Here, at the end, we see Sun / Moon / Astraea as noted using light blue. As mentioned before, this is about an injustice that is unresolved. Justice must be had here. Given the upcoming Thor’s Hammer days circa November 14/15, we shudder to think of what may happen if whatever coverup(s) have been going on are not exposed in a peaceful manner. 1. 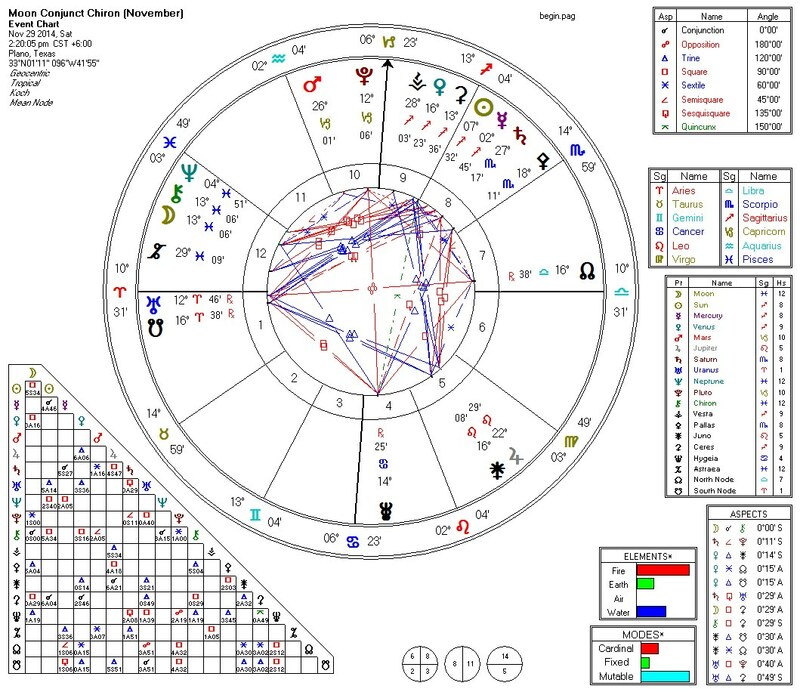 Jupiter BISeptile Ceres (and Ceres square Neptune): This is a large, higher order set of issues involving education and law (Jupiter), the food supply (Ceres), and healthcare & drugs (Neptune). 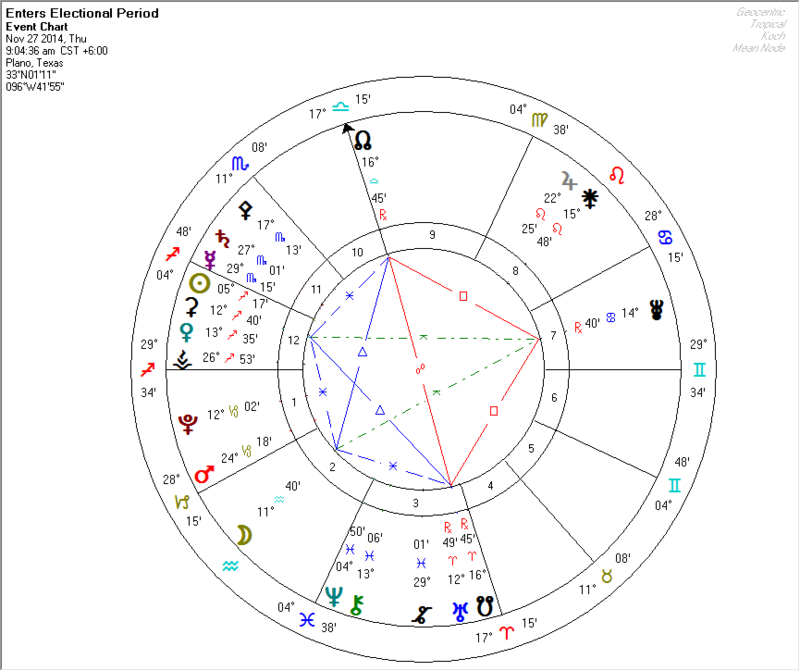 Jupiter in Leo indicates that we can expect dramatic changes, Ceres in Sadge strengthens Jupiter’s role, and Neptune introduces a sense of urgency and annoyance as the solutions dissolve into failures (and lessons for better solutions in the future). 2. 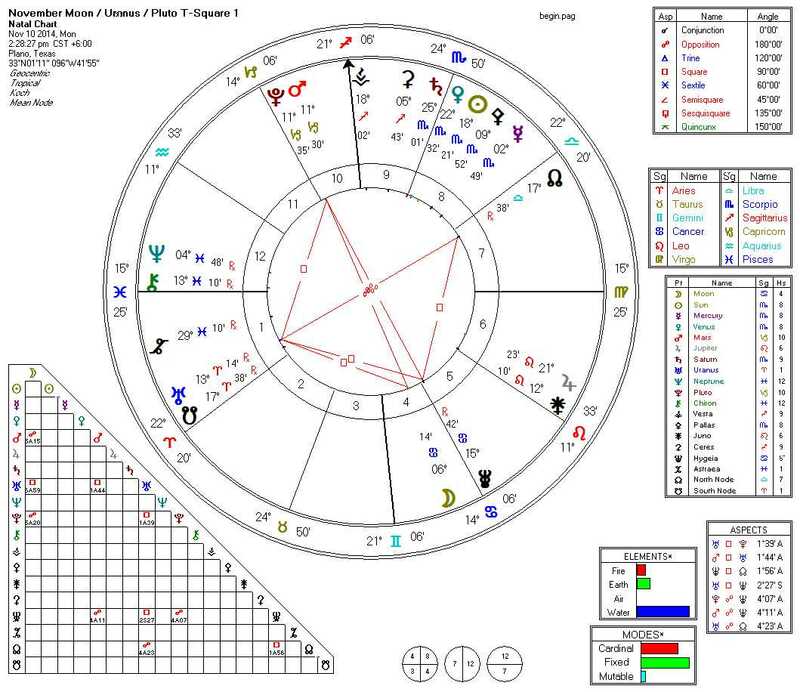 Juno BiSeptile Saturn: Issues and trust and betrayal collide with policies that may be too “bare bones” to protect those that should be protected. Change becomes necessary. 3. Pallas TriSeptile Uranus: in the low form, surprise attacks. In the high form, insights that result in breakthroughs, particularly technological breakthroughs. Given the nature of Pallas, some of these may be military in nature and the information not available to the public. 4. Vesta BiSeptile Astraea: Similar in many ways to #3. A push to address injustices boils to the surface. The Vesta / Mars semi-octile discussed earlier ties into this and is the “pebble in the shoe” that heightens the pressure to obtain justice and redress the wrongs.